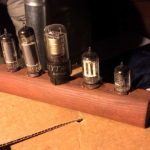 One easy and inexpensive radio-geeky thing that you can do that your significant other *might* let you display in the living room is a display of vacuum tubes. My original display was just a piece of bannister with some sockets glued into it so I could switch out with cooler tubes when I found them. Then the owner of Wilmer’s antiques in Sausalito gave me a laminated black wooden stand that I immediately knew would become my next tube display. I cut out 2″ round holes and filled them with foam. This allows you to just stick in the tubes much like a dried flower display. The tubes in my collection are all retired (they don’t actually work), but appearance is what matters now. 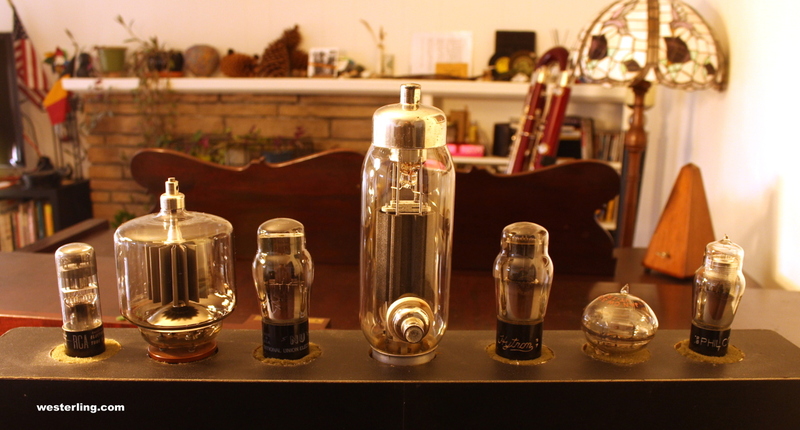 My current collection of tubes is as follows – left to right: 1) RCA “Magic eye” tube. 2) Eimac 3-500Z (donated by KPH) 3) National Union 80 4) Cool mystery tube (donated by Herb Brams) 5) Hytron 43 6) Western Electric 316A “Doorknob” used in WW2 airborne radar (donated by John Zimmer) 6) Philco 78 (missing top cap).